Day 5 of 14. 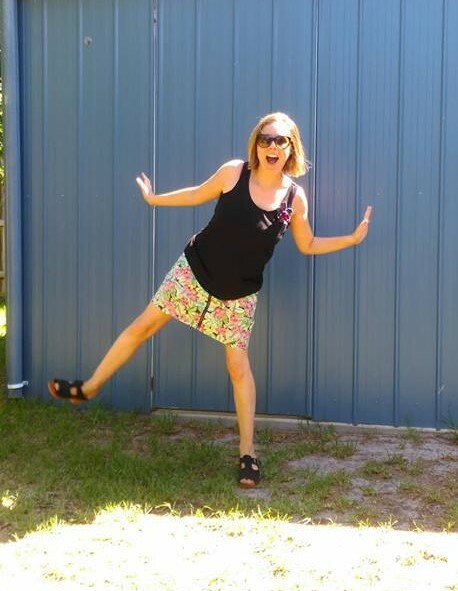 Vinnies Victoria #newyearnewstyle thrifty fashion challenge. The first time I'm wearing my skirt and black sleeveless top from my chosen 10 piece collection. Clogs are new-to-me; they were $4 from Vinnies, too. Day 5 of 14. Photo by Mr 7. "Tropical silliness"
Wouldn't fancy my chances of making this challenge interesting over here at this time of year - unless I'd be allowed to rotate a succession of second hand coats!